Enjoy the beautiful White Point Gardens and the Battery, facing Charleston Harbor. Whether you stroll along in the moonlight or as the sun is just coming up over the Atlantic Ocean, you'll experience the history and romance that have charmed visitors for more than 300 years. 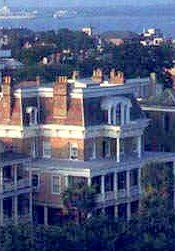 This and other Charleston Bed and Breakfast Inns can be found here in The Register.